 Vagnsset med 3 tankvagnar typ DR GDR "VEB Collective Combine Minol"
Vagnsset med 3 tankvagnar typ DR GDR "VEB Collective Combine Minol"
By buying this product you can collect up to 1596 bonuspoints. Vagnsset med 3 tankvagnar typ DR GDR 'VEB Collective Combine Minol', totallängd över buffertar 30 cm, epok IV. 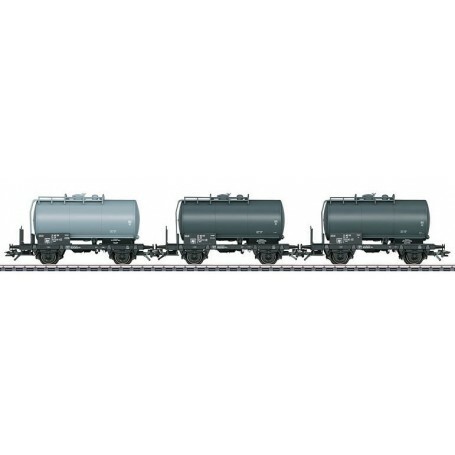 Prototype: Three 2-axle tank cars with handbrake platforms and end ladders, for transporting oil. The cars are painted and lettered for the German State Railroad (DR GDR), leased to the VEB Collective Combine Minol. The cars look as they did around 1980. Model: The cars have separately applied brakeman's platforms and filling platforms. The partially open car floor is modelled. Length over the buffers per car approximately 10.0 cm / 3-15/16'. DC wheel set E32376004.